We don’t have extensive pickling experience. It wasn’t part of childhood traditions to pickle fresh food at the end of the summer and then rely on it all winter. Though we have become acquainted with mason jars in the jelly making process, we haven’t really done much pickling of our own, either. That said, the whole idea and process seems like a wonderful tradition of American agriculture that should be, and is to some extent, making a comeback. Growing crops all summer, and then taking the fresh, bright, summer produce and preserving it, sounds wonderful. Even without a garden, the idea just sounds great. It goes well with seasonal eating patterns, sustainability, and tasty food. Not only do we like the theoretical idea of pickling, we love pickles. We’ve talked about Fried Pickles before, and a plain old dill pickle out of the jar makes a great snack. But pickles don’t have to be limited to cucumbers. One of our favorite small plates at The Family Dog is a pickle plate, comprised mostly of root vegetables with bell peppers and other veggies thrown in here and there. 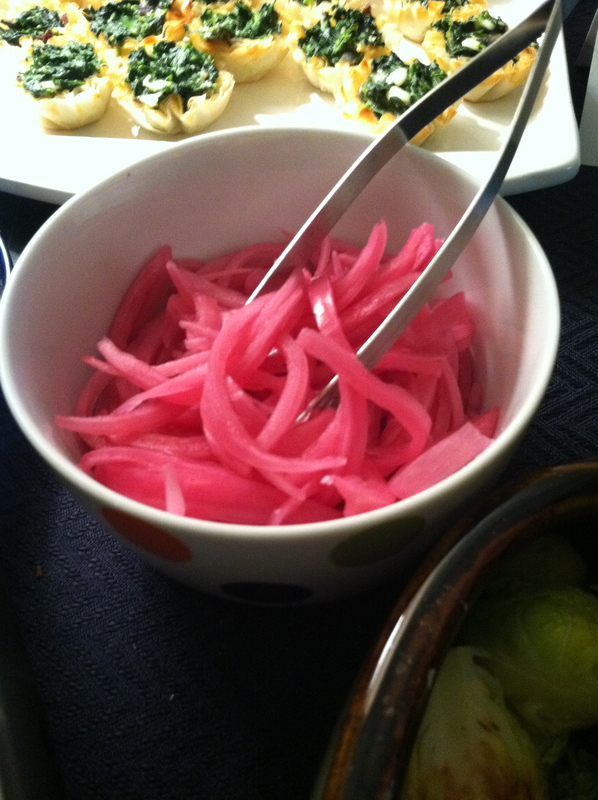 Pickled watermelon rind is a Southern favorite – and though a bit funky at first, thoroughly enjoyable. Pickles are everywhere – and we love trying new varieties (except, maybe, for pickled pigs feet). So – when were making pulled pork a few weeks ago, and were looking for accompaniments beyond the typical slaw n sauce, we turned to pickling. We found a simple and delicious recipe from Thomas Keller’s Ad Hoc Cookbook, and it added just the right briny, yet sweet & oniony flavor to the pork. We think the recipe is a great starter for pickling, and we hope to do much more in the coming months.